When Ain’t Misbehavin’ became a Broadway hit in 1978, the music of Fats Waller at its core was roughly 45 years old. Perhaps forgotten by many, at least the songs’ first flush of success were still within living memory for many theatregoers. 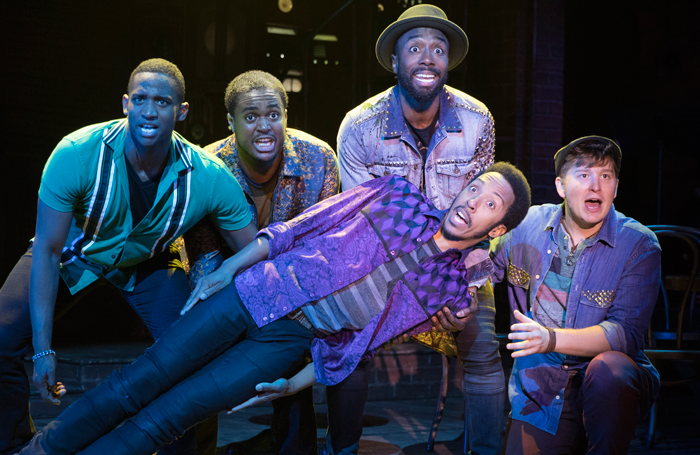 When Smokey Joe’s Cafe became a Broadway hit in 1995, the tunes of duo Leiber and Stoller – recorded by many artists – were for the most part 35 to 40 years old. When Mamma Mia! hit it big at the end of the 1990s, Abba’s biggest hits were some 20 years in the rearview mirror. The people who may have made the songs successes when first released – buying them on 45rpm vinyl or (shudder) eight-track tapes – are likely those who went to the stage incarnations decades on to recapture the music of their youth. Those patrons were at the prime theatregoing age bracket of over 40 and in so many cases over 50. How much these shows succeeded on their creativity or simply nostalgia – though it was likely a combination of both – is something for a social science study. This came to mind last month when Smokey Joe’s Cafe reopened in New York, in an Off-Broadway venue roughly a third of the size of the Broadway house in which it ran for some five years. The show is 20 years older and the songs, sung by Elvis, the Coasters and more, are in their late 60s. The teens who had made them into hits are now in their 70s. The oldies radio stations that introduced me to these songs – slightly before my time, though I’m fond of many from that era – are now playing tracks that were popular when I was in college. I wondered if the most natural audience for Smokey Joe’s had aged too much – would the theatregoing audiences of today bring the same nostalgia and familiarity to make the show a hit once again? At the same time, the 1980s hits of the Go-Gos, wedded to a vintage prose poem in the new musical Head Over Heels, seem to offer that nostalgia factor that might lure in prime audiences. The show has already prompted articles looking back at where the 1980s girl group, the first female team to write and play their own instruments and gain mainstream success, existed at the nexus of punk, power pop and Top 40s radio. Few people my age could be unaware of the Go-Gos, thanks to their ubiquitous presence on MTV in its earliest days. Another jukebox-style show to use music to appeal to range of audiences is Moulin Rouge!, now playing its first public run in Boston. Some of its central numbers – retained from the source film – were hits when I was rather young, such as Your Song and Lady Marmalade. But with 17 years elapsing since Ewan McGregor and Nicole Kidman played the doomed lovers on screen, the creative team of John Logan, Justin Levine and Alex Timbers have been careful not to let the stage score become too deeply backward-looking. So hits by Adele and Lady Gaga, unwritten and unsung in 2001, are now front and centre, alongside Elton John and Patti LaBelle. All this serves to raise the question of the longevity for box-set and jukebox musicals. Can they successfully continue to incorporate non-theatrical scores into a new form and new story in ways that transcend their initial popularity and a nostalgia-hungry audience? This is especially true the further away they move from the songs’ initial popularity. Will Rock of Ages or Xanadu, to name but two, stand strong in revival 20 years from now, long after their flush of recognition for the songs may have faded, or will their fans have aged too much to sustain full houses? While not driven by changing sensibilities – much discussed with the returns of My Fair Lady and Carousel this Broadway season – will evolving times and fading memories mean these musicals, loved by audiences and disdained by the cognoscenti, have impending sell-by dates? Indeed, staging Smokey Joe’s Off-Broadway, not Broadway, suggests that there may be enough interest out there to sell 4,000 tickets a week, but not 10,000. At the same time Beautiful, which focuses primarily on Carole King’s pop hits from the 1960s, has enjoyed a sustained Broadway run with material that sits between the eras of Leiber and Stoller’s two-minute ditties and Benny and Bjorn’s glam hits. Like the music itself, we can only wait and see whether these pop hit musicals will stand the test of time. Meanwhile, excuse me while I put in my earbuds and sing along to Guys and Dolls, written more than a decade before I was even born. Why does that score keep a hold on me? Because I can recall my mother singing A Bushel and A Peck to me – as a lullaby. Now that, to me, is timeless. Producer Ken Davenport has put himself in the rare company of musical legends like George Abbott with his new show. He not only produces but has co-written the book for the new Broadway musical Gettin’ the Band Back Together, about a group of 40-somethings reuniting their high-school rock ensemble for a Battle of the Bands. Davenport teamed up with comedy team the Grundleshotz on the book, and the score is by Mark Allen. John Rando directs the production, the rare Broadway musical not based on pre-existing material, which opens Monday. The musical version of Pretty Woman, the first major hit film starring Julia Roberts, reaches Broadway for a Thursday opening, directed and choreographed by Jerry Mitchell, with a score by Bryan Adams and Jim Vallance. The book is by JF Lawton and the late Garry Marshall, who partnered on the original film. Samantha Barks and Andy Karl play the lead roles, embodied on screen by Roberts and Richard Gere.